Once again I wanted to do something I haven't done for a looooong while, so I dug out my nail art striping tapes and decided to do something with those. Do you guys even remember them? They were a mild hit many years ago before any nail vinyls and such. Lately it seems that no one is using them anymore and I quite quickly remembered why... But first, let's take a look at the mani I did with them. 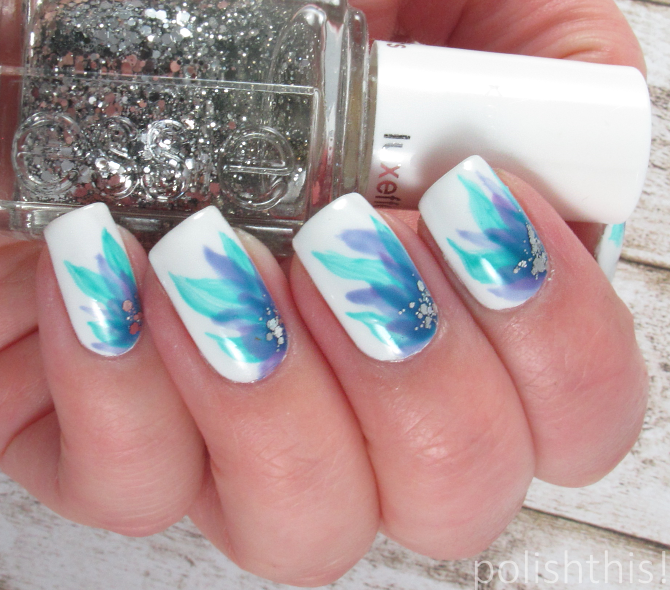 I started with one coat of Gina Tricot White so that the gradient colors would pop out more. 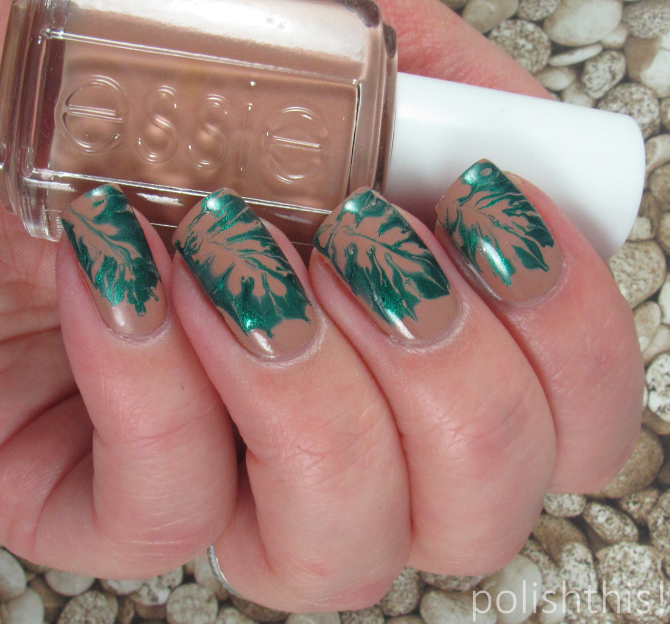 Then I did the gradient using Picture Polish Winter and Autumn, both such beautiful polishes! I still had to do quite a few coats to get the colors to show up properly, but I think the white base helped a little. 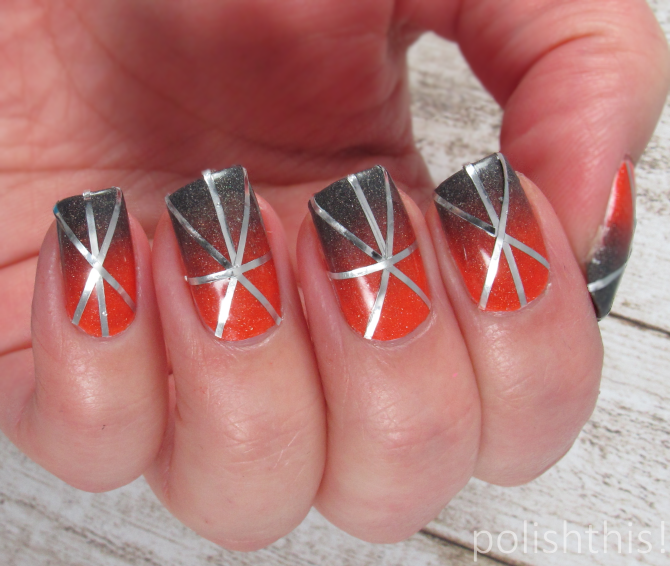 After my gradient base was dry I started taping my nails with silver striping tape. The actual taping of the nails was quite easy. I remembered it being way more nerve-racking that it really was and I managed to do my nails quite quickly. I also tried to be super smart and I used a little bit of nail glue to secure the ends of the tapes on the tip of the nails. 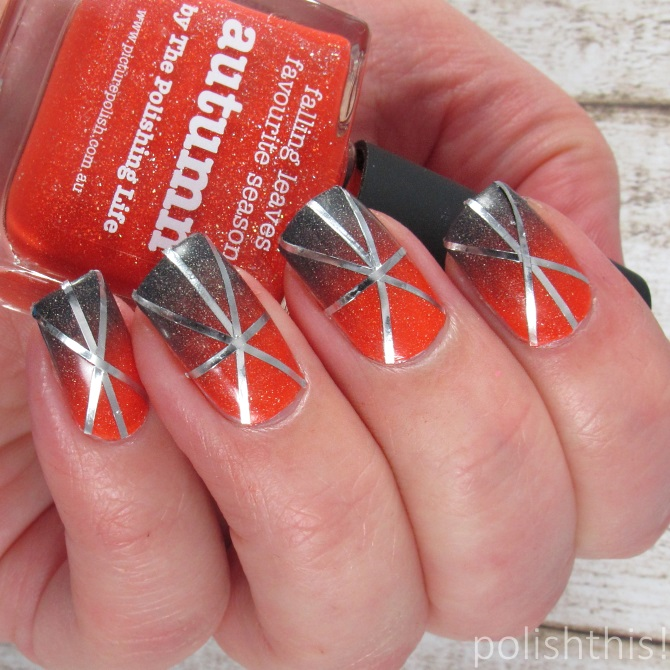 Then I also did two coats with top coat and I really thought the tapes would stay on my nails at least for a day. But no, they didn't! Only after an hour or so I started noticing that some of them were already sticking out. I still tried to fix it with a little more of nail glue, but it didn't really help. I didn't have time to do another mani, so I went to work with some of the tapes sticking a bit out, but nothing too major. After a full day of work though I only have couple tapes left... So yeah, I don't think I'll be using these type of tapes any time soon. But hey, at least I have a great excuse to change the manicure (like I ever needed one). Do you guys still use these striping tapes or are they just collecting dust in drawers like mine were? Hi guys! Hope you've had great weekend so far? 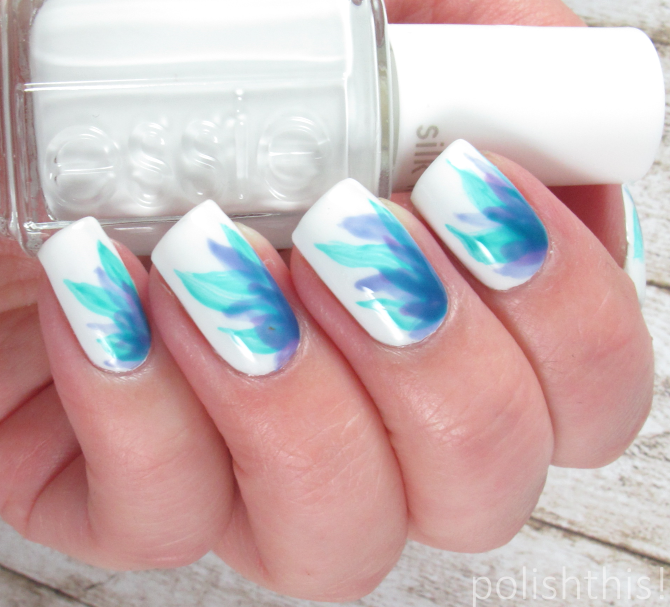 I have another nail art look with the Essie Silk Watercolor polishes to share with you guys today. This time I wanted to try some freehand painting with the watercolor polishes and I came up with this floral look. I've said it million times before but I really love these Essie Silk Watercolor polishes and the endless nail art possibilities they give! I've done several different looks with watercolor polishes, but I hadn't tried freehand painting with them before this. This time I also used the white base polish that comes with the Silk Watercolor collection: White Page. It's quite regular white polish, but has pretty nice formula as it covered with two easy coats. 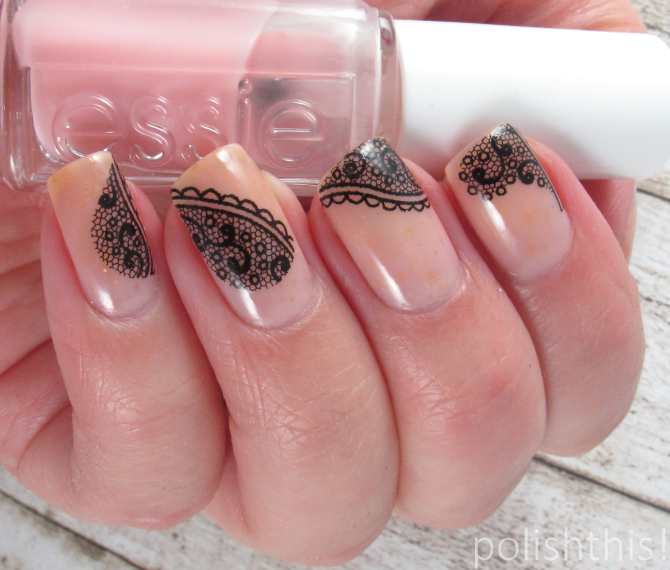 I think that was quite nice as it has that small Essie brush. After the white base I used Mereneid Sari Artist 4 brush and three of the Essie Silk Watercolor polishes to paint the flowers. First I painted few petal on each nail with the turquoise Pen & Inky, then I used the blue Point of Blue and finally I painted a few smaller petals with the purple No Shrinking Violet. It seems that I always end up using on or more of these three shades; the turquoise, blue or purple one out of these watercolor polishes... These three are so pretty that I always choose them even if I don't mean to, but I think I'll need to do the next look with the reds or oranges. As a final touch I also added just a little bit of silver glitters from Essie Set In Stones to complete the look. This was quite simple look to do, but I was quite proud of myself that I was able to do some freehand nail art for a change. It might be simple look, but I loved how it turned out! I have a random swatch spam for you guys today for a for a change. It's not a huge spam as I only have three indie polishes to share with you, but all three are such beautiful polishes that they deserve all the attention! This first pretty is Cadillacquer Where the King Goes, the Realm Follows which is a beautiful light teal crelly with golden glitters. This has an awesome formula for a crelly as it only needed two easy coats for full coverage. It's a stunning color, definitely my type of shade! This beautiful cyan blue creme is Miami-Dade from Cirque Colors Vice collection. It's a light but still really bright and fun color with pretty awesome formula too. I only needed two easy coats here. This is the first Cirque Colors creme for me, but I surely will be getting more as this really convinced me that they can do great cremes in addition to all the pretty shimmers, holos and others. Last but not least is F.U.N Lacquer Storm. This beauty was released in their limited edition collection last year, so it might be quite hard to find now, but maybe not impossible yet. I really really love this one, so much so that it ended up in my top polishes list from last year. It's really unique shade of dusty mauve with holographic shimmer and glitter and silver flakies. I don't really own anything quite like it! I used two coats here, the formula is a bit thick but definitely manageable. So tell me, which one of these three is your favorite? I haven't done drag or dry marbling for ages and didn't really even remember that it was one possibility. But after seeing this gorgeous design by Sveta Sanders, I just had to do a drag marble look myself. I used first one coat of Essie Picked Perfect on each nails. Then I did another coat with the same Essie polish and immediately applued some Zoya Giovanna while the Essie was also still wet. Then I just used a tooth pick to drag the polishes on my nails. My design isn't really as neat as Sveta's but I still really liked the look. I'm quite sure though that I should figure out some other drag marbling tool that tooth picks as they seem to be a bit too wide for this. I haven't really paid too much attention to those drag marbling/water marbling tools before since I've felt like you can use pretty much anything for this purpose, but now I think I'm going to need to reconsider. Anyhow, like I said, I really liked this leafy design. I think it's quite fun look and Picked Perfect and Giovanna were really a perfect pair for this. Drag marbling is quite easy to do, I don't really know why I haven't done it more often. Do you guys like this drag marble look? 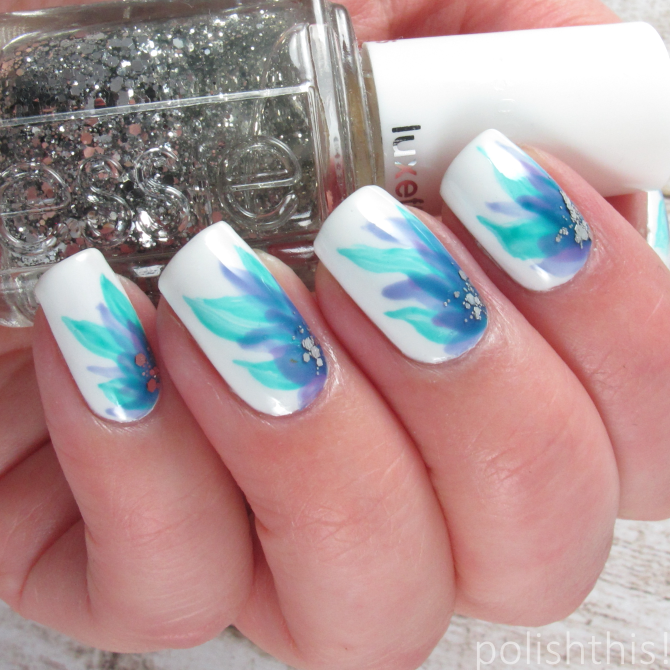 Have you ever tried drag marbling? Happy 2016 everybody! Yesterday I shared my favorite manicures and the highlights of 2015 with you guys and today it's time for my favorite polishes of 2015. I've done similar listings before too and it's always so hard to narrow the list down. This year I managed to keep it a little bit shorter and I only chose 16 favorite polishes that came out last year. If Zoya dominated my 2014 favorites list, this year it was definitely Essie. I had even to try to limit the number of Essies on my list in order to have room for other brands too. 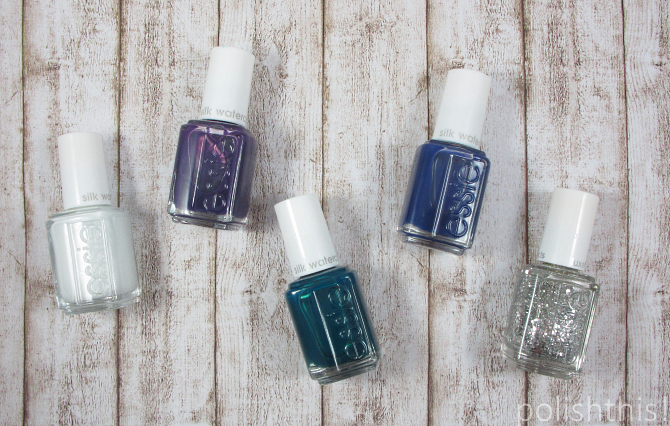 I think it's safe to say that Essie was my favorite brand in 2015. 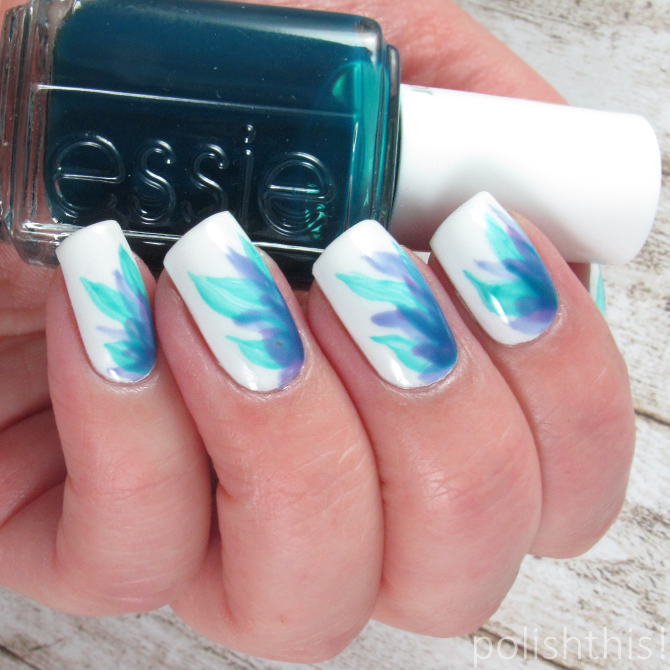 Essie's spring collection Flowerista was a huge hit for me and I loved all the polishes from the collection. Both Garden Variety and Flowerista are such gorgeous cremes and definitely my favorites of 2015. I could have chosen even more polishes from the spring collection on my list as I equally loved the beautiful mint Blossom Dandy and the gorgeous bluish grey Petal Pushers, but I had to draw the line somewhere. Saltwater Happy from Essie's summer collection and Virgin Snow from the winter collection are both such stunning soft creme shades that they just had to be in this list. Frock 'n Roll is the only shimmer I chose from Essie, but it's definitely one of the most interesting and unique polishes that Essie made last year. Essie and especially their cremes were definitely my favorites last year, but I didn't forget my other favorite mainstream brand Zoya either. I always have special place in my heart and in my Helmer for Zoya shimmers and this year I especially loved the spring collection shimmers Leslie and Rayne. Selene from the summer collection is another stunner and such a unique polish that you really have to see yourself to appreciate its beauty. This time only one OPI made it to my list. I did get only few polishes from OPI last year and I have to say that only one stood out from them and it's the beautiful green called That's Hula-rious from the spring/summer collection. I'm pretty sure the beautiful blue Give Me Space from the Starlight collection would have made it to my list, but I don't own it yet. It's definitely my type of color, but I'm still pondering if I really need it or not as I do own similar colors already. Out of the total of 16 favorite polishes seven are from indie brands. F.U.N Lacquer Storm is from the 2015 Limited Edition collection and I'm so happy that I got it while I could as it's just such a stunning polish. I'm not usually the biggest fan of neon polishes, but KBShimmer Bahama Drama is such a gorgeous color and it's finally a neon that suits my skintone perfectly, so I just had to include it on my list. I can't really resist beautiful mints, so it's no surprise that Delush Polish Amazemint is high on my favorite list, it's just so pretty! Picture Polish was definitely one of my favorite brands last year and I could have really included more PP polishes on my list, but this time I only chose the stunning red Arabian. I still have quite a few Picture Polishes that came out this year on my wishlist and I'm sure many of them could have even ended up on this list, but I just haven't gotten them yet. 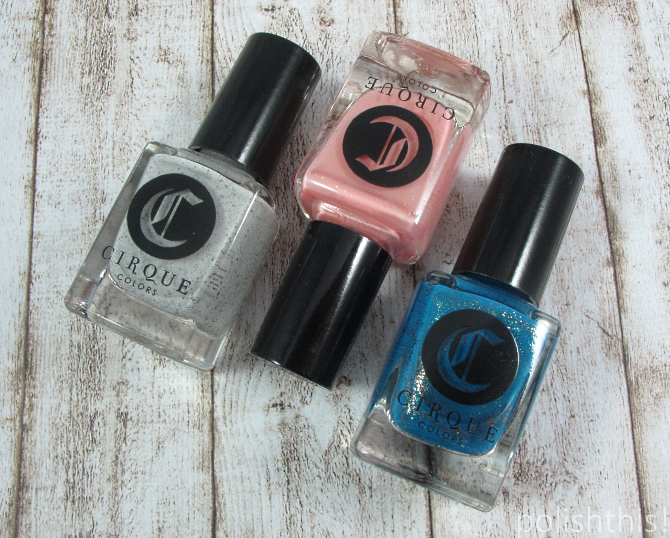 Last but definitely not least are three polishes from Cirque Colors. Hatch, Love Stone and Qi are all from the wonderful spring collection and they are all such beautiful shades that I just couldn't leave any of them out of this list. If I had to choose one favorite indie brand, it might easily be Cirque Colors, but thankfully I don't have to do that. I've usually loved fall color and collections, but 2015 was quite obviously all about the spring colors and collections for me. My two favorite collections last year, Essie Flowerista and Cirque Colors The Awakening were both spring collections and I could have easily picked all the polishes from both of the collections to this list. It also seems that I have finally started to appreciate good cremes also, as I've usually been more about shimmers, glitters, holos and such, but this time there's quite a few cremes on my list. So those were my favorite polishes of 2015. Do you guys have any same favorites on your lists or which ones were your favorites last year? 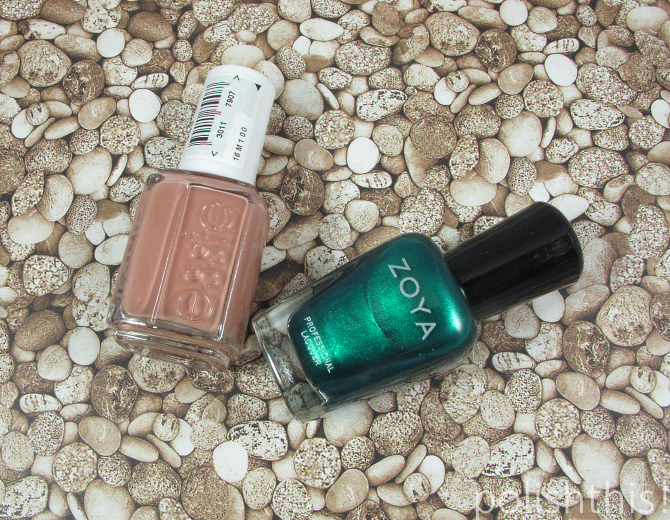 *Some of the polishes in this post were provided me for review, some were purchased by me.